Offers good corrosion resistance (equal to 316 stainless steel in many applications). For use in waste water treatment, hydraulic oil lines, instrumentation, sampling lines and similar flow control applications. Recommended for optimal corrosion resistance against acetone, benzol, amylacetate, aniline, hydrocyanic acid, and many other corrosive and noncorrosive fluids. The 60-900 Series is a RP&C Barstock Globe Valve. Available from 1/8" through 1/2". Maximum operating pressure of 5,000 psig at 100° F.
TFE packing is recommended for high pressure air and gas applications. Grafoil® packing is standard. Maximum temperature for PTFE packing is 425° F.
Malleable iron handle for long lasting reliable service. The Apollo® 60A Series Steel & Stainless Steel Barstock Globe Valves are ideally suited for use in instrumentation, sampling lines and flow control applications. Backseat stem design reduces pressure exerted on the packing, prolonging packing life. Design also prevents stem from being accidentally turned out of the valve. Externally adjustable PTFE packing is standard, graphoil available as an option. Malleable iron handle for long lasting, reliable service. 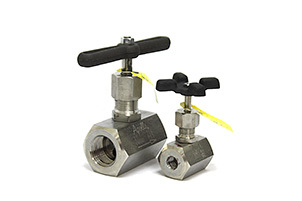 Max Operating Pressure: 5000 psig @ 100° F., 345 bar @ 38° C.
The Apollo® 60B Series Steel & Stainless Steel Barstock Globe Valves are ideally suited for use in instrumentation, sampling lines and flow control applications. All valves 100% pressure tested. Fully threaded bonnet to accommodate optional panel mounting nut. All pressure retaining parts constructed of ASTM materials. Meets the requirements of NACE MR-01-75. Max Operating Pressure: 10,000 psig @ 100° F., 689 bar @ 38° C.